The Municipal Archives and Library collections contain material that provide a vital backstory to today’s efforts to gain equal pay and equal employment opportunities. They illustrate the sustained efforts of women to gain equal pay as New York City teachers in the late-19th and early 20th centuries, and the efforts beginning in the 1970s to win equal pay and employment opportunities for women in City government, including the appointment of women to leadership positions at City agencies. After the consolidated City was created in 1898, the New York State Legislature set a uniform pay schedule for New York City teachers in 1900 that applied to all of the formerly separate education districts. The “pay bill” set salaries based on gender; women were paid at a lower rate than their male counterparts, even though the vast majority of teachers were women. In particular, this was a big setback for female Brooklyn teachers who previously had been paid at the same rate as their male counterparts. Due to the pay bill, the starting pay for female teachers was $600 annually while starting pay for male teachers was $900. The rate of salary increases also was set in the same discriminatory fashion: $48 annual increments for women compared to $105 annual increases for men. Whether teaching in elementary or high school, in science or writing, the State Legislature enshrined the principal that women teachers should be less than men. Drawn from the Department of Education collection, accounting forms illustrate the different pay structures. A 1907 ledger from PS 10 in the Bronx shows the salaries paid to teachers of different grades. 12 of the 67 teachers are male and all are assigned to 7th and 8th grades; the 55 women teachers educate the primary grades. 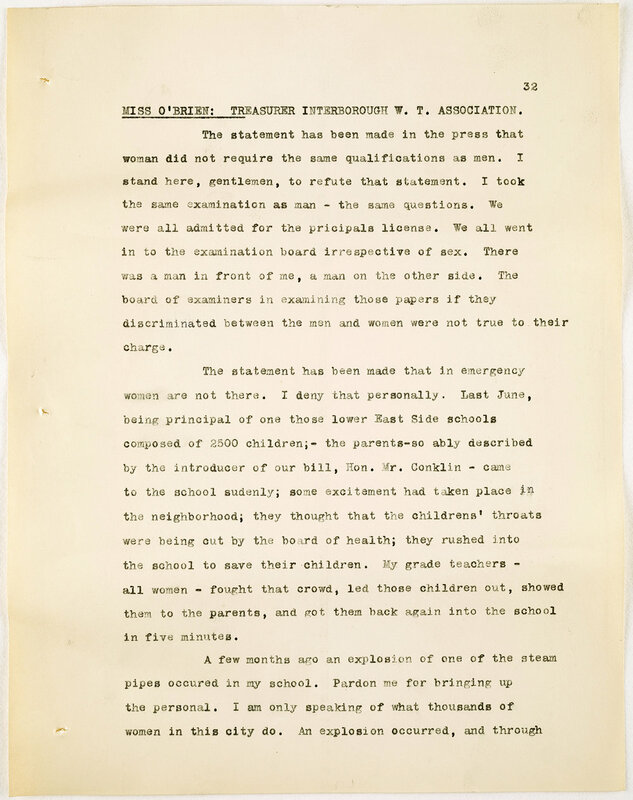 Testimony from female teachers before the State Assembly in 1907 on pay equity. Between 1900 and 1911, women teachers and their supporters in trade unions and suffrage organizations worked to achieve equal pay. In an unprecedented move, women journeyed to Albany to lobby legislators in 1907—the first time women ever spoke at a State Legislative hearing. The State Legislature passed equal pay legislation, but the bill was vetoed by Mayor George McClellan. At this juncture, legislation concerning New York City was acted upon by the Mayor in addition to the Governor. (Oh don’t we wish this was still the case?) This fleeting success spurred the creation of the Association of Men Teachers and Principals who opposed equal pay. The women activists received pledges of support from William Gaynor, the Democratic candidate for Mayor in the 1910 election. He was true to his word and in 1911 equal pay for City teachers became the law. But…it was a limited reform: the “Equal Pay Law” equalized the starting salaries of men and women teachers but did not apply to teachers hired prior to the 1912 enactment date. So the preponderance of teachers continued to be paid in an unequal fashion. Women teachers also fought for the right of married women to continue to teach and for mothers to teach. For decades, women teachers, and their union, continued to make a case for equality. Legislative improvements were enacted in a piecemeal fashion, until finally in 1947 the salaries of elementary and secondary school teachers were equalized. Letters from the collections of Mayors Seth Low, McClellan, and William Gaynor illustrate the debate around equal pay. Equal pay is connected with equal access to job opportunities in all economic sectors. One approach to closing the gap is paying people equally for performing work that requires comparable skills. This “comparable worth” or “pay equity” approach requires a rebalancing of the value placed on different occupations, taking into account training and skills to fairly value the work that women perform. Another approach is to diversify the work force, doubling down on efforts to recruit and hire people under-represented in various jobs. Materials from the collections of the Commission on the Status of Women and the Human Rights Commission document efforts to achieve equal employment opportunities in the 1970s. In 1970 The Human Rights Commission, headed by Eleanor Holmes Norton, conducted research and convened hearings on the status of women and minority workers in New York City government. In part, the study showed that female City workers were concentrated in two agencies: the Board of Education and the Human Resources Agency. Public Employee Press from August 21, 1987. In 1975 the Chairperson of the NYC Commission on the Status of Women suggested that Mayor Beame approve a study of the civil service system to determine how and why women were underrepresented in various job titles. Eventually, in 1984, a campaign by women’s rights groups and unions successfully pushed for a city-funded pay equity analysis whose results supported increased pay for some traditionally “female” city jobs. As employment opportunities expanded, women began agitating for appointments to decision-making positions in City government. The Commission on the Status of Women’s analysis of mayoral appointments between July and December, 1976, showed that women comprised 29% of Administrative appointments and the pay differential between male and female appointees was $14,981. In 2014, Mayor Bill de Blasio appointed women to 52% of the administration’s top positions. Formal barriers preventing women from working in various occupations have been dismantled but women remain concentrated in certain fields: education, health care, administration, with lower pay scales compared to male-dominated occupations. A 2013 Workforce Profile on City Government shows that 51% of all managers are women. However, women remain concentrated in lower paid fields: the base salary for paraprofessionals and administrative support staff is approximately $20,000 lower than the base salary for skilled craft workers. Women comprise 76% of public school teachers and only 16% of the uniformed services. The gender segregation in employment coupled with low pay has a disproportionate impact on family mobility because women now are the primary wage earners in 40% of American families. On average in the United States women earn 78¢ compared to each dollar earned by men. In New York State, the average is 86¢. Back when I started working on these issues women earned 59¢ to the $1 earned by men. But, at the current rate, it will take another 44 years for women to achieve parity in earnings, according to the Institute for Women’s Policy Research. While the residue of discriminatory rules, pay practices, and laws continue to constrain women, there is some good news. In 2015, young women with college degrees, ages 16-34, (the Millennials) in New York State earned $1.02 compared to each $1.00 earned by their male counterparts. It remains to be seen if this is the start of a good trend or a blip in the data. It’s unfortunately likely that this gain will be fleeting. The American Association of University Women reports that within one year of graduation, a woman working full-time earns only 82 per cent as much as her male counterpart, regardless of the occupation: doctor, lawyer, scientist, or teacher. Generally, the wage gap increases as women age, particularly when women begin to have children and don't have access to affordable child care, paid family leave, or paid sick days. A female 2014 high school graduate who is employed at a salary of $20,000 annually will make $700,000 less over the course of her lifetime than a male in the same situation. That’s enough to buy another 196 cups of coffee a week.